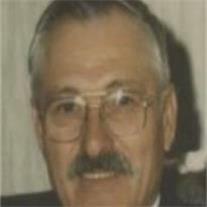 Roland J. Lafleche, age 80, passed away on April 24, 2011 at his stepdaughter Flora and Robert’s Chandler, AZ home. Roland and his wife Flora have been living there since 2004 when Roland became ill and they could no longer live in their own home. He was born in Castleman, Ontario Canada, to Albert Joseph and Rose Marie Dagenais Lafleche on August 31, 1930. Roland is preceded in death by his parents Albert Joseph and Rose Marie, his two sisters Jeanette and Yolande and two brothers Richard and Jean Guy. Survivors include his wife Flora (nee)Sanchez, his step-daughter Flora Aguilar(Robert), their children, Robbie (Susan,)grandchildren Alexander Socrates and Ryan Augustus. Michealla (Michael) grandchildren Savanna Quinn and Gannon Diego Heslin. Paul (Dee) Perez and grandchildren Tyler James, Pablo Cody Madelyn Wilma and expecting another baby in October. Step-daughter Catalina (Stuart Ryan) their children Cody (Breanna) Dennee,, grandchildren Brandi and Brae Lynn, US Army Ranger Staff Sergeant Tyler (Leah) Dennee and their child Isabella Rosa. Bianca (David) Garrobo their children Micah, Nevaeh and Angel. Step-daughter Robin (Leonard)Frederick their children Laci Marie (Ian) Allen, Levi ( Shelby) and baby Leonides, Lincoln, Lane. Landis Mathew, that has preceded Roland and is now in heaven. Roland is survived by biological children Lisa (Greg)Burke their children Jesse and Christopher and his children Samantha and Alex. Four sons Gaeton, Louie, Claude and Yvan. He was a lumberjack in Canada at a very young age. He then worked in the mining industry in Canada and later he came to the United States. In 1960’s he worked in Grants New Mexico uranium mining and later in Safford in copper mining. There he met Flora and they married in 1973. They then started a hog farm and worked night and day mostly by themselves rarely did they hire outside help. They traveled to market their hogs to California. They sold the hog farm in 1996, Mom stayed home and Roland couldn’t take it sitting down doing nothing so he became a handyman until he had the misfortune of falling off of a roof. He was air evacuated to Good Samaritan where he spent many months healing from all his injuries. As the time passed his lungs became a big problem and he had a very hard time breathing. He was diagnosed with Restricted Pulmonary Disease attributed to all the years of working in the uranium mines (underground) before the U.S. government came in and put in place all the rules and regulations about wearing masks, having blowers and all other safety precautions that they have now. It took its toll on him little by little. The U.S. government compensated him by providing 24 hour nursing care seven days a week since October 2009 till he breathed his last breath. He was very blessed he had five real great nurses, they worked 12 hour shifts and they truly took real good care of Roland and loved him also. His nurses were Louise, Valie, Misty, Kelly and Joe. When he was in the hospital and I Flora (step-daughter) could not be with him they would take turns visiting without being asked or being compensated. They are truly the angels of mercy. Roland’s hobbies included work seek puzzles, watching wrestling, repairing whatever needed repairing and he read one book after another. Robert, Roland and myself we were always trading books to read. My Mom didn’t quite get into the reading like we did. VISITATION WILL TAKE PLACE AT CALDWELLS FUNERAL HOME AT 112 E MAIN STREET, SAFFORD, AZ 85546. VIEWING ON SUNDAY MAY 8, 2011 FROM 6-7 PM ROSARY IMMEDIATELY FOLLOWING 7-8 PM. THE ROMAN CATHOLIC MASS WILL BE CELEBRATED AT ST. ROSE OF LIMA CHURCH AT 311 S CENTRAL AVE. SAFFORD, AZ 85546 ON MONDAY MAY 9th, 2011 AT 11 AM. BURIAL WILL TAKE PLACE AT THE SANCHEZ FAMILY CEMETARY IN SANCHEZ. Contact Flora Aguilar at 480-656-2518, or 480-980-0123 for any further information.